I love you. Thanks for getting things to work again so quickly. I was going blind from all that white. You can paste it in the menu search too. Is this skin also are problems with black page in Word, Excel and the browser bar. I didn't get an dll files with download??? Actually I got them copied by removing the 2 dlls that were already in it and placing the new ones in, but the DARK CC theme still isn't working. i wonder, do i have to install both, uxtheme and ultrauxtheme? or just one of these? Ok what changes does the reg file make because the one included with the theme DOES NOT WORK. Even after a reboot I am still not able to copy the modded files over. Meh back to Linux. Thanks a lot man! This is f****** awesome! Really good job indeed! I bought the premium version beacuse I really appreciate your work! And icons are simply SUPER!!!! Keep up buy theme for support. The theme patching turned out pretty nicely for me and everything works, but I get an annoying white border, around where files and folders appear, on any dark theme. "Mino Dark Blue Theme For Windows 10 November Update 10586"
I think it's a wonderful Theme, had help to install it, but worth more then the time & $2.50. Does it work in latest windows update 10586.63? Since I installed Windows Update "KB3124263" which updated the Windows 10 Build to 10586.63. When I replace those 3 dll files it now causes Start Menu, Taskbar Volume, Taskbar Calendar, and WI-FI network manager not to work. I think this error not by you replace those 3 dll files. I'm using win 10 (10586.63) all is working good. 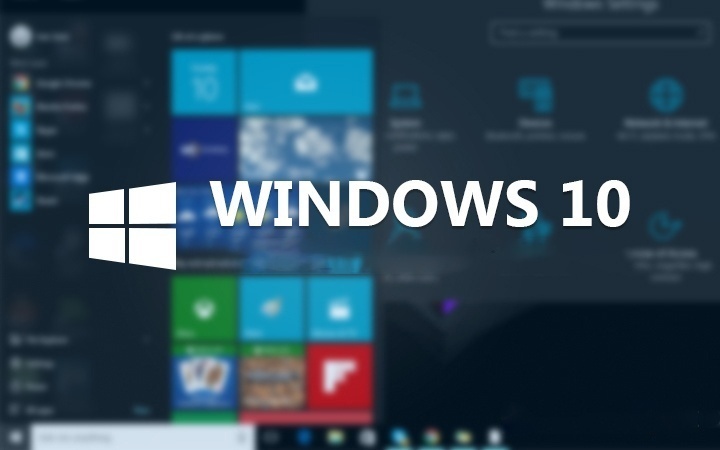 You replace those 3 dll files before you installed Windows Update "KB3124263" which updated the Windows 10 Build to 10586.63 or after you installed Windows Update "KB3124263" which updated the Windows 10 Build to 10586.63? Can I use this with my 10240 build? my Windows 10 didn't upgrade. I have done every step (I swear) and it doesn't work :( Windows 10 1511! Olá estou com o seguinte problema, dou todas as permissões mais na hora de copiar e substituir os arquivos da pasta "File Patch x64" para a pasta "System32" da o seguinte da imagem abaixo. Link da imagem! 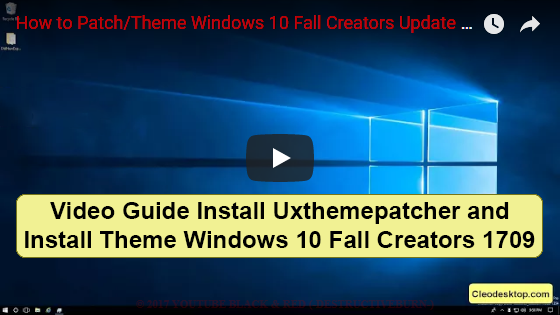 Hi, the above "Download UXThemePatcher For Windows 10 Version 1511, 10586 Download Link" leads to a "UXThemePatcher 10.sfx.exe". I tried this exe and it is a FAKE.exe trying to install lots of garbage ant Trojans and does NO MORE contain the 3 dll's! Sorry for that... I have update again...remove it. Please check again. Thanks! Depois de algumas tentativas, conseguir fazer todo o processo do tutorial a cima, mais pra minha surpresa depois de reiniciar o PC, ele não aparece imagem apenas fica com a tela piscando! O que eu devo fazer pra voltar ao normal? Amigo, eu tive esse mesmo problema, fiz todo o processo acima e no fim, além de não aparecer o tema novo, quando eu reiniciei apareceu a tela piscando! Esse UXThemePatcher do vietnamita aí não funciona! Eu recuperei o meu sistema usando a Restauração do Sistema, mas através do disco de instalação do Windows 10. Você conseguiu resolver o seu problema? Se ainda não, se quiser, eu posso tentar ajudá-lo, valeu? Entra em contato. Abraço. What Windows 10 Professional (10.0.14267)? I got White parts still on the theme itself. Even after rebooting. can we use ribbon disabler?? Hi, Love the theme and bought two of them. There's only one problem: after awhile some parts getting white again and i have to reload the theme. It happens after the screensaver was active. I don't think it's a theme problem, it happens with other theme's aswell. Does the theme stay after windows build update? I am windows insider and get preview updates. What patcher to use with my Build no. Hi,Thank you very much for this,it quite frustasing having WIN 10 and no third party theme possibility but u changed that thank you! It's an easy tutorail step by step image provided,really easy and awsome. Still,even so i've some part that stay white as u can see here please help. Does this work with windows 10586.164? Thank you for your work but same problem than Jan-Erik Jeromin, after reboot first grey screen and then black screen. I had to use my R-Drive Image bootable CD to reboot my PC. I use W10 PRO x64 10586.164. No problem to rename themeui.dll file, but I had to change permissions in security tab with uxinit.dll and uxtheme.dll files to rename them. I used Universal Theme Patcher with Windows XP and Windows 7; UXStyle with Windows 8.1 PRO and I've never had any problems. Sadly I think there isn't any solution for now, anyway thanks a lot. Sorry, this method works perfectly in my Windows 10 PRO x64 10586.164. My problem was than I was trying to apply an incompatible theme (Silk them) with my Windows 10 version and was getting grey and black screens. I downloaded compatibles themes and works right. Once again thanks a lot for this post. yo man I ve been doing all the stuff said here for like 3, 4 times and I ve been getting the grey black screen with only cursor...so you say that s cuz the theme I tried was not compatible with the windows 10 version? ?if so how do I know if a theme is compatible or not?? You need check your windows 10 is what version? Will I be able to undo the changes to the system32 folder by doing a system restore if it all goes wrong? hey i want to buy ur themes but i dont know if it will work for my laptop i have windows 10 Version 1511 OS Build 10586.218 will it work for me ? if you buy theme so just contact me on http://www.cleodesktop.com/p/contact-with-cleodesktop.html I'll install theme for you. Thanks! Well this is rather disappointing… I installed the UXThemePatcher, and installed modded the files for themeui.dll, uxtheme.dll uxinit.dll by replacing the ones from UXThemePatcher, I reboot the system, and then I go to change the theme, it applies it and then it just starts flashing the screen black and white. You only have been error "starts flashing the screen black and white. This Patcher stuff is needed for skinpacks like the dark glass? Anyway...my issue is this: I can rename themeui.dll to .dll.del, but when I try to copy the patched x64 file to the sys32 folder, I cant, it says basically file already exists and never lets me copy it over/overwrite it. And of course I have the take ownership reg installed. I'm on the latest 10586.420 and have installed uxstyle at some point, but have it uninstalled ATM. Why is my themeui.dll either locked/inaccessible/hidden. I can delete the themeui.dll renamed to .del.dll and delete it from the recycle bin. But still can't copy the file over, like the real themeui.dll file is being hidden/inaccessible? I have installed by mistake a RTM theme and now I am getting that annoying black and Grey screen. Also, I haven't done a restore point... What should I do? Fast way is reinstall windows. pls help me out there is no OldNewExplorer Setting.png there is only a folder oldnewexplorer and in it 4 files among them there is oldnewexplore confg there i got a install button.. then what i hv to do? OldNewExplorer Setting.png have in file theme download, Check again. okkk nw only my settings bar just changed into black.. but not my file browser... now what? Please up for me your screenshot of bug. Thats very good to know this new fix, thanks! Ok, so I have done some further investigations and please disregard my previous comment. Heya, your tutorial is so good and everyone did it right but I make a terrible mistake..
How can I restore when the screen is black, cannot see anything..
Should I go to computer repair? Did black screen can be repair? Thanks, I hope you can answer this question because my dad gonna mad at me if he know what did I do on my laptop.. ahahahaha.. seriously..
if you change theme so still have white background, You need change to default theme then restart computer. After restart complete - now can apply new theme and enjoy. Perfect! Thanks for adding the bug fixes as well. I purchased. Keep up the good work friend! Where is the picture picture "OldNewExplorer Setting"? Contact me on [here] and send for me screenshot of bug. I'll fix it for you. UltraUXThemePatcher for 14915 i mean? I don't yet test on 14915. I see you're using windows 10.0.10586.494 so you need replace 3 file themeui.dll, uxtheme.dll uxinit.dll in system32 with guide in tab "Patcher For Win10 Build 10586 aka 1511"
if you still have trouble installing the theme so just let me know. I will installed theme for you via teamviewer. Ok. and please keep up buy theme for support. Thank you so much! why the left panel on theme setting always give white colour ? not following the background colour ? hi, i liked this theme, but there's a little bug, when i applying your theme, notification tray was look smaller in hidden place. after restart all icon tray are disappeared in hidden place. can you tell what's going on? i will send you a preview in your email. What Incomplete? and What confusing guide? I am stuck on this step Copy all file in "Theme" folder to "%windir%/Resources/Themes". I don't see the files, did everything but that. Can I install UltraUXThemePatcher 3.1 right over the older one 3.0? after applying all patches for creator update the screen keeps blinking black. what is the solution to this problem? If you buy theme please contact me [here] mI will support you install theme. I can't seem to install the UltraUxThemePatcher on creators update, it won't stick, any ways to remedy this? Running version 1703 os build 15063.138. Hello, I have installed the theme on annyversary w10. I updated to creators and now the icons are black over a black background, so i dont see them. They become black only if I make them big, on small size i can see them. Any way to fix this? I have Warning on top website: Don't use theme of windows 10 anniversary update 1607 for Windows 10 creators update 1703. It that may cause you problems and error for system. I have downloaded windows 10 creators update official from microsoft and installed. Just wait me a bit time, I will update theme for it and send for you. I didnt use it. I had annyversary, i installed your theme. Then i updated to creators, reinstalled theme and i got black icons. I used the patcher for creators but rest of files I used the same as for annyversary. You should format and install new clean windows creators 1703 from iso. Hi, I can't seem to find the "OldNewExplorer Setting" picture... Would you be so kind to help? If you buy theme please contact me [here] I will support you install theme. With this update, does not work, any solution? Thanks! After installing ultra theme patcher, lots of error comes up. like mmc.exe application error! can you please fix it? The theme broke and now it's not gray (was using Minimal Dark) after I signed in to windows account on Win 10. I tried to reinstall a new theme (Numix Dark), following instructions (Take Ownership of .dlls, OldNewExplorer, File Patcher), and rebooted but it still does not work. Also tried to set theme to Default, then reboot, and change theme again to Numix, but it still doesn't work. I have Win10 1703, if that helps. ultra theme patcher not working. I have updated. Read again. I got it working on the Windows 1709 update. Make sure you're using Oldnewexplorer 1.1.8.4 (uninstall old version first). And I think the changes don't take effect until you log off. I am using build 1703 currently and I am using a theme built for 1607 which works perfectly. do you know if 1607 themes will work with 1709? 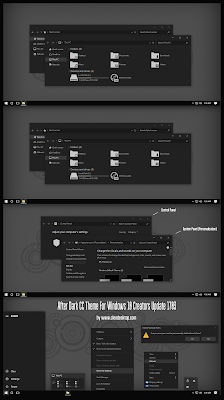 UXtheme patcher installs on 1709 - for the life of me i can not get any of the dark themes to show the file explorer black. Any ideas? Hi! hope you all fine. is there any way to patch Windows 1709 (16299.64)? do you have any free themes for 1803? I really like YosemViber Dark Theme, Numix Dark Blue and After Dark CC. Can i get a demo of one of them for free to see if i think its worth buying? I'm sure theme like preview 99% . If you have difficult install theme, I will support you install theme or install theme for you via teamviewer.